NMC Virtual Worlds is a program of the New Media Consortium. Our mission is to help learning-focused organizations explore the potential of virtual spaces in a manner that builds on community knowledge, is cost-effective, and ensures high quality. 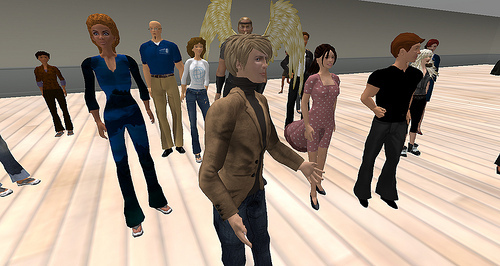 NMC Virtual Worlds provides a palette of premium custom services for education and training, and conducts an ongoing series of events, conferences, and programs. A suite of pro bono services and fellowships are a central aspect of the organization, and reflect our deep commitment to learning and access. Congratulations to the “Virtual Oaxaca” Project! On 6 – 8 September Innova Junior College, the Centre of Excellence for New Media, and the Media Development Authority will host the 2010 New Media in Education Fiesta (NMiEF). The fiesta includes the NMiEF 2010 Spotlight Conference, New Media in Education International Conference on Second Life and Innova Film Festival. For more information see the New Media in Education Fiesta Website. Welcome back to everyone who attended the NMC Summer Conference with us in Anaheim, it’s been a busy couple of weeks since, catching up with work and adjusting to the time difference again; they say it’s worse going West to East and I would have to concur! It’s been a busy time over at Linden Lab by all accounts too, with layoffs and then the retrurn of Philip Linden to the helm, but rest assured that while continuing to explore all the alternatives from Unity to VirtualLife, NMC Virtual Worlds is still absolutely committed to the Second Life platform! For the many folks interested in our OpenSim demo I’d like to remind you that we do still have 4 sims up and connected to OSGrid for you to visit and try for yourself. Just make an account and download the Hippo client from osgrid.org and log into NMC Campus as your starting location. We’re also gearing up to trial our own self contained grid independent of OSgrid so stay tuned for more on this and the opening of our new orientation island & conference centre! Another how-to based on recent questions I’ve been asked, this time, how to show YouTube movies on a prim using shared media in Viewer 2 without showing the whole page. This happens to be a music video from one of my favourite bands, the Octopus Project! In fact all you’re doing is adding _popup after the word watch in the url so YouTube thinks it is playing the movie in a pop up browser window and therefore omits the rest of the page contents. Hope this comes in useful to you! This story comes to us from Jack Green Musselman and Jason Rosenblum of St. Edward’s University. Their recent project, Plato’s Allegory of the Cave, is located on the NMC Campus in on Teaching 3. What is the Cave & Why is it useful? The Cave is often used in philosophy classes (and others, too), to creatively describe the process of learning, moving from a state of darkness to enlightenment. Much like the inhabitants of Plato’s Cave chained as they face the shadows on the wall, those who learn something new might, at first, not understand a new subject and even remain reluctant to see it as it is. But, bit by bit, as they grow used to the new subject’s content and implications in their life, they might feel pity for those who don’t understand this new knowledge and even have a hard time helping them “see” why they should, too, learn about such new topics. The allegory is, of course, a fable, but like all allegories it hopes to make a deeper point: viz., learning can be a long, difficult process and resistance is, quite understandably, normal. Students in any walk of life, then, might take comfort in comparing themselves in a philosophy or mathematics or literature class to the prisoners in Plato’s Cave, for they all might not wish, at first, to see the light, and later, once they understand more about a new topic, they might find those who don’t understand are also reluctant to move from darkness to light. College students who read about the Cave’s prisoners could simply intellectually describe their own past experiences learning new material in ways similar to Plato’s Cave prisoners. Students might ask questions about the physical location of various parts of the Cave or about Plato’s theory of knowledge inherent to the Cave’s description of learning, but, cognitively, they can understand the basic point made by the Cave allegory. What Second Life does, we believe, is to richly compliment this cognitive approach to the Cave with a phenomenologically more robust understanding of the prisoners’ perspective. That is, it is one thing for an instructor to describe the Cave to students who read about it, or to lead a discussion about the allegory of the Cave as students are learning new material. It is something of a different order, though, to inhabit an avatar as he or she experiences, first-hand as it were, what the prisoners in the Cave see and hear. We believe that for an instructor the SL Cave adds an essential affective dimension to the cognitive approach of simply reading the text or hearing a lecture about it, thus adding to the intellectual understanding of the Cave’s allegory a more immediate emotional grasp of what it is like to move from darkness to light. After we started brainstorming about how a simulation of the allegory could work in Second Life, we started thinking of ways to take advantage of the strengths of the space. It was important to strike a balance between staying true to Plato’s concept and the limitations of the space—while making the environment one that was conducive to a live class. First, we had to ask the obvious question—Was this even possible? Plato’s allegory required that a person imagine that they were chained together with people they knew, while only seeing shadows on a wall. Given that it’d be easy to have people role-play with their own avatars, we moved forward with a design that would let groups of students participate in the simulation together, rather than participating individually. Coming up with a way to simulate shadows on the wall and animating avatars to sit chained together required a bit more research. However, an even larger question loomed. Where exactly were we going to put a cave large enough to accommodate a class? We had just started leasing space on the Teaching 3 Sim from the NMC, but the land lease wasn’t large enough. Luckily the NMC had a plot adjacent to the one that we were leasing, so we took it. So, until the lease was finalized we used other sims like Ed Tech Island as a sandbox to test what it would take to build a ‘realistic’ cave in Second Life. This question naturally led us into another limitation—prim count. To keep the prim count low, we decided to use sculpty objects to allow us to size individual prims larger than is typical for a single prim. This turned out to be a crucial decision given the size we needed the structure to be and the relative low number of prims at our disposal to use. We built and tested a cave structure on the Ed Tech Island sandbox using a sculpty kit designed for cave scenes, set the sculpties to be phantom objects (objects that you can walk through) and erected transparent “barriers” that hugged the edges of the cave to prevent avatars from actually flying through the structure. Once additional land was leased from the NMC, we had to decide where to build the actual structure. Under water at first seemed like an option—but there’s no water in Plato’s story, so that wouldn’t work. The most straightforward alternative left was to place it above ground. So, the Cave was assembled on our new plot of land, using layers of scultpy stones, and a bench was assembled to accommodate a small group of students. That left the puzzle of how to place the avatars in chains and to animate shadows. A chain link was obtained and a chain was assembled link by link. The chain was made to run the length of the bench, while conforming to its shape. The process involved tweaking the position of each set of links to match an average sized humanoid avatar that had been animated with a poseball to sit in a seated position with its hands behind its back. In the end, seven poseballs were spaced along the bench to allow a group of students to simultaneously role play through Plato’s allegory. A series of transparent particle emitters were then setup and set to randomly display one of several “shadows” that were created as silhouettes in Adobe Illustrator, and sourced from public domain images. A campfire was added outside of the Cave as the source of the light for the shadows, and static figures were added to provide the illusion of people for the shadows. We’re planning to run the simulation once again in Fall 2010 in another philosophy class, except that we’re planning to have more students. Ideally, we’d like to upgrade the sim and provide animated figures by the campfire instead of the static ones to provide a more realistic effect. We’re also hoping to get more feedback from students on their experience to better help us make future upgrades and figure out how we might better integrate the sim as a tool to help students learn philosophy. To read more about the Cave and to learn about how it was used this semester, please see “Plato’s Allegory of the Cave” published in the May edition of Academic Commons, “Advancing towards Liberal Arts 3.0”, http://www.academiccommons.org/commons/essay/plato-cave-second-life , or visit the sim in Second Life at: http://maps.secondlife.com/secondlife/Teaching%203/83/233/24%20%20 . NMC Virtual Worlds will be at the 2010 NMC Summer Conference in Anaheim to present our session Second Life Horizons – Catching Up with Another Year of Virtual Worlds on Thu Jun-10, 10:30 AM PDT- 11:45 AM PDT. If you plan on attending, please feel free to say “Hi!” through our Pathable page. If you’ve been reading Beth’s design diary you’ll already know we’re working on a new orientation island for Viewer 2 over here on the NMC Campus so I thought I’d give you a sneak peek of our progress with the Disneyland Castle (in recognition of this year’s Summer Conference venue) in the foreground and the Brussels Atomium in the background. We’re very excited by the opportunity to try and create a magical, educational and informative experience for new users here. The theme of a World’s Fair will hopefully give it a global appeal. The design concept is a simple linear path with the minimum of boring signs, to quickly teach the basics without overloading a new user, while discreet diversions will offer all the in-depth information a more experienced user or return visitor might require. The project also offers a unique opportunity for you to visit while we work, as it’s being developed right in the heart of the NMC Campus on the sim currently named Conference Centre South. Remember it’s a work in progress, but you’ll be able to see us develop everything from the overall plan, to the largest architectural constructions, to the smallest, scripted, interactive elements. If we happen to be around we’ll also be happy to answer your questions and discuss the issues around a project such as this. Perhaps it’ll even inform or inspire your ideas for a project you’d like us to develop for you in the future! As I was recently asked the question of how to enable dynamic shadows in Viewer 2, here it is for all to use. If you didn’t even know SL had dynamic shadows, they’ve been around for at least a year now, but have remained an unsupported feature, tucked away behind a twisty path of submenu options, so use at your own risk! The review panel has completed its work reviewing the proposals for the NMC’s “Free Island in Second Life!” competition. We received many excellent proposals and we would have loved to have been able to fund them all! This July, thirty stellar K-12 schoolteachers from around the United States will participate in a four-week, National Endowment for the Humanities-funded, summer institute in Oaxaca, Mexico, offered by the Wired Humanities Projects, University of Oregon. The Center for Learning in Virtual Environments will collaborate in the creation of a simulated “Virtual Oaxaca” that will enhance these experiences. The participants will anticipate their experience together by building a virtual environment between April and June. Once in the field, in July, they will use the space to capture and display the journey as it unfolds, engage students from around the world to participate, chronicle what they are learning, and represent and remix their findings with the public. Prior to the journey to Oaxaca, they will begin by placing Flickr sets anchored to a 3-D map of the state of Oaxaca that features ancient pre-Columbian cities (such as Mitla, Monte Alban, Teposcolula, and Calixtlahuaca), living indigenous communities (homes to colorful handcarved wooden animals, shiny black pottery, or wool woven into geometric-patterned rugs), key spots in the capital city (such as the textile and art museums, the beautiful ethnobotanical garden, the chocolate mills, the open-air craft and food markets, the manuscript restoration workshop, the history museum and library in the sixteenth-century convent, contemporary art studios, the film center, and even our own classroom spaces. Classroom spaces will be the scene of many social and cultural activities, including linguistic and musical demonstrations. The plan is to experiment in creating a contextual space for dialogue about indigenous peoples’ origins, struggles to survive in the face of conquest and colonization, language evolution, evolving art practices, and filmic portraits. The team will shape a mini-world where participants will be able to represent their Mesoamerican inquiries and interactions with indigenous collaborators and faculty, journaling the experience with wikis and other Web 2.0 media inworld and in context. In the opinion of the reviewers, this project not only was structured in a way that made full use of both the resource and the time frame in which it was available, but also exemplified the potential of a virtual environment for sharing rich cultural experiences that can blend both the real and virtual. We look forward to seeing what they do with the island! Linden Lab has contacted us to reach out to the NMC community and find individuals that would be interested in being paid mentors for a Beta test of newcomer orientation. The Beta test will run for one week and will involve an 8 hours per day/ 40 hours per week commitment (Pick your shift between 8am and 8pm PST). The final dates of the Beta test have not yet been set. Please let me know if you would be interested at beth@nmc.org. Be of the first to join our brand new facebook fan page! 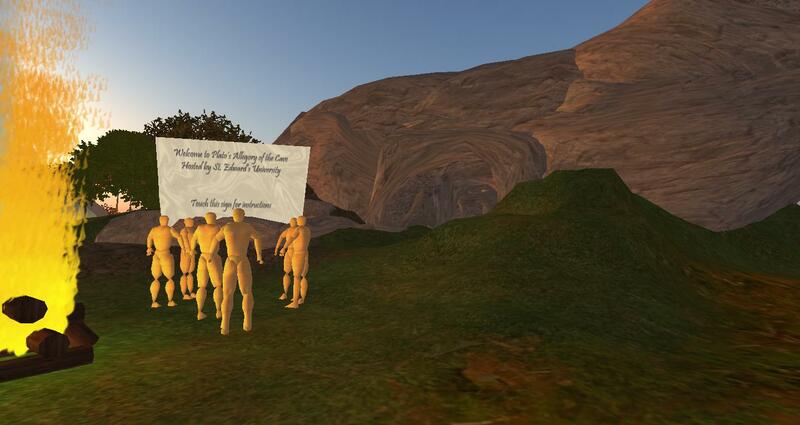 We’ll use this page to collect your input, find new ways to help the SL educator community, connect you to amazing Second Life stuff, facilitate virtual world discussions, and update you on NMC Campus events.